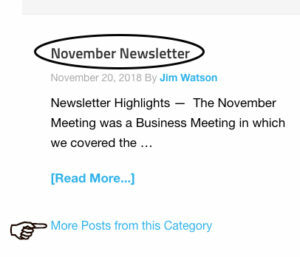 FAQ – How do I view past Newsletters? 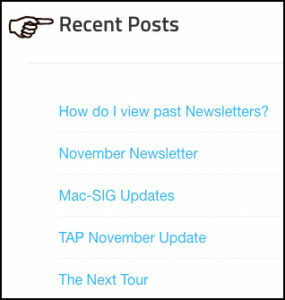 You are here: Home / FAQ's / FAQ – How do I view past Newsletters? So, what happened to the previous Newsletters? On the website, lower right, home page, under Newsletters — click on ‘more in this category’. The current Post will contain Newsletter Highlights and a link to the full Newsletter PDF that you may view and/or download. Also note that when you are on any Page or Post, links to the latest Posts are always available in the right hand sidebar.